The world is on the dawn of the outbreak of a major conflict: trade war is being waged between the USA and China and between the USA and Russia, while European countries are lacking any leadership and drifting ungovernable because they have surrendered their currency and with it their sovereignty to bureaucrats. Beijing is not satisfied with the fact that the dollar is an international currency. Along with the rise of its economic power China would like to play an increasing role in financial affairs. Russia, encircled by NATO, is currently implementing a large-scale rearmament program. In 2010 Moscow announced it would have modernized 70 percent of its military hardware by 2020. In 2016 civil defense exercises were conducted, in which allegedly 40 mln people took part. In Moscow anti-nuclear shelters are being built.1)„Pachnie wojną” R. Szeremietiew o zagrożeniu ze strony Rosji, youtube 2016-10-19. When in 1937 Heinz Guderian stressed the growing importance of self-propelled armored vehicles in his “Achtung Panzer” (Beware the Tank! ), not all of the military analysts appreciated the significance of the German strategist’s insight. A few years later those who disregarded this problem learned the importance of the new weaponry the hard way. 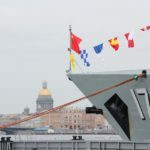 Chinese warships in the Yellow, South China or East China Seas aren’t anything unusual, but their even short-lived presence in the Baltic Sea is an event which deserves more attention. The Middle Kingdom is growing from a local to world power. Its interest scope is not limited to the nearest neighbourhood, like it was in the years 1950-53 during the Korean war or in the case of 1979 skirmishes with Vietnam. The appearance of the Chinese naval fleet in Kaliningrad and Petersburg is a part of the military cooperation with Russia signed by Beijing and Moscow for the years 2017-20202)China and Russia sign military cooperation roadmap, The Diplomat 2017-06-30., which is the result of the American politics aiming at isolating Russia, which in turn has made both countries cooperate more closely. Washington is still arming Taiwan, and does not recognize that Beijing regards it as a rebellious Chinese province.3)US clears arms deal for Taiwan worth up to $1,3B, DefenseNews 2017-06-29. At the same time the United States is trying to take out Ukraine from the Russian zone of influence and is also reinforcing the military potential of the countries of Middle-East Europe. This policy has led to a military rapprochement between Russia and China, and as a result of it Chinese warships now entered European waters within the scope of military exercises “Joint Sea 2017”. Both Poland’s and Lithuania’s ministers of foreign affairs expressed disapproval of this show of military force at their border. 4)Russian and Chinese fleets put pressure on NATO in the Baltic Sea, Pravda.ru 2017-07-12. This Sino-Russian military cooperation is the direct result of the NATO’s deployment of troops and military equipment to the Baltics. The presence of the Middle Kingdom’s warships is not limited to the Baltic Sea. In July 2017 they arrived in Istanbul, Turkey, and Piraeus, Greece, both NATO member countries.5)Chinese navy fleet docks at Instanbul port, DailyNews 2017-08-01. 6) Chinese naval fleet arrives in Greece for friendly visit, Greek Reporter 2017-07-24. China has also military bases in Djibouti, East Africa 7)Nowy imperializm? Chiny otwierają bazę wojskową w Afryce, Strajk.eu 2017-07-13. and in Gwadar, Pakistan. Certainly, China wishes to have a greater say internationally and to this end the Middle Kingdom is taking advantage of the American half-hearted offshore balancing strategy in Europe. Which means that the United States is trying to prevent any power from arising, using to regional friendly powers8)Wikipedia rather than having its own military involved in distant corners of the world. Apart from China, Germany and Japan are potential contenders to the US world dominance. An alliance between Russia, one of the world’s largest oil and gas producer, and Germany the world’s leading manufacturer, would be a direct competitor to the US. The Ukraine crisis cut off Russia and its abundant resources from Europe and especially Germany. The tensions between Russia and the United States induced the Sino-Russian cooperation. The proponents of “offshore balancing” want the US to concentrate on the protection of its own territorial integrity and security instead of maintaining a more and more expensive imperial army, building “nations” and being involved in all kind of armed conflicts. In a multi-polar world and the emergence of new powers like China and the numerous conflicts around the globe, the US is not able to maintain its military presence all over the globe. United States military withdrawal encourages China to step in. The lack of American military presence makes the regional states look to Beijing for protection or support like the Philippines, a country whose relations with the USA are deteriorating. Is Russia improving its relationship with its neighbours at the cost of the United States? In 2016 Fu Ying, China’s former ambassador to Great Britain claimed that a lasting anti American alliance between China and Russia is questionable. She underlined that several times at the turn of the 19th and the 20th China concluded treaties both with the Russian Empire and the Soviet Union, but the alliances were short-lived. She compared relations between China, Russia and the USA to the equilateral triangle in which the distance between Moscow and Washington is the largest.9)Chiny-Rosja-USA-sztuka balansowania. Bardzo ciekawa analiza chińskiej ambasador, PCH24 2016-01-20. The United States does not seem to have a strong position and is becoming isolated. Berlin and Paris may not stand up to Russia as Washington’s allies. Relations between the US, Germany and France were never as bad as they are now under the Trump administration. These two countries are willing to form a European army so they can liberate themselves from the NATO’s protection. Turkey’s role in the treaty is deteriorating rapidly. Increasing tensions between Ankara and Washington strengthen the former’s contacts with Moscow. In spite of shooting down the Russian aircraft by the Turkish air forces in 2015, Ankara is economically more dependent on Moscow than Washington.10)Raprochement between Russia and Turkey, DW 2016-10-09. Putin’s realism paid off: Turkey’s ties with NATO have been weakened. By the end of July 2017 Turkey signed an agreement on the supply of the defensive missile system S-400.11)S-400 agreement with Russia ‘a done deal,’ Erdogan says, Daily Sabah 2017-07-25. Dr Jacek Bartosiak, Polish specialist in geostrategy, and author of “Pacific and Eurasia. On War”, draws attention to Chinese infrastructure plans in Eurasia. According to Bartosiak China is striving to build a new Silk Road, connecting it with Europe by a rail and road line, thus realizing the thought of Halford Mackinder, British father of geopolitics and strategy, who claimed that: “who dominates the heartland of Eurasia by communication and commercial routes will stop being dependent on sea routes which have determined wars since the days of Columbus”.12)Jacek Bartosiak-Chiny&USA Konfrontacja, youtube 2017-03-08. By creating land trade routes and building a port in Pakistan on the Persian Gulf the Chinese are becoming less dependent on traditional maritime connections such as the narrow Strait of Malacca. The activity of the People’s Republic of China in Europe is not accidental. Apart from building the new Silk Road the China-Central and Eastern Europe investment cooperation fund is investing in wind-farms in Poland, solar-plants in Czechia, education in Hungary and manufacturing in Bulgaria, thus strengthening its position on the old continent. As Nicolas Spykman’s said: He who rules over Eurasia rules the world. China military strength is still increasing. The essential question arises: when will the leaders of the powers acknowledge that the convenient moment has come for a global confrontation ? 1. ↑ „Pachnie wojną” R. Szeremietiew o zagrożeniu ze strony Rosji, youtube 2016-10-19. 2. ↑ China and Russia sign military cooperation roadmap, The Diplomat 2017-06-30. 3. ↑ US clears arms deal for Taiwan worth up to $1,3B, DefenseNews 2017-06-29. 4. ↑ Russian and Chinese fleets put pressure on NATO in the Baltic Sea, Pravda.ru 2017-07-12. 5. ↑ Chinese navy fleet docks at Instanbul port, DailyNews 2017-08-01. 6. ↑ Chinese naval fleet arrives in Greece for friendly visit, Greek Reporter 2017-07-24. 7. ↑ Nowy imperializm? Chiny otwierają bazę wojskową w Afryce, Strajk.eu 2017-07-13. 9. ↑ Chiny-Rosja-USA-sztuka balansowania. Bardzo ciekawa analiza chińskiej ambasador, PCH24 2016-01-20. 10. ↑ Raprochement between Russia and Turkey, DW 2016-10-09. 11. ↑ S-400 agreement with Russia ‘a done deal,’ Erdogan says, Daily Sabah 2017-07-25. 12. ↑ Jacek Bartosiak-Chiny&USA Konfrontacja, youtube 2017-03-08. 13. ↑ Xi praises mailitary’s history, ChinaDaily 2017-08-02. 15. ↑ Przewaga USA nad Chinami i Rosją jest ogromna, Fronda.pl 2015-07-03.